I welcome the significant progress achieved by contractors who are building a new boardwalk to replace to the steep Seahill steps along the North Down Coastal Path. Official opening is due to occur on Monday 30 March 2015. After years of lobbying by myself and others I am delighted to see this alternative route created, bypassing what was the most difficult stretch of the North Down Coastal Path. 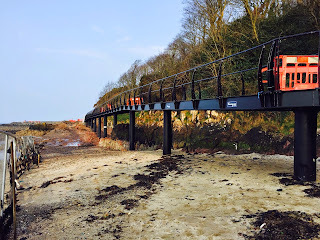 With work continuing apace during difficult weather conditions over the Winter period final completion of this vital link along with the North Down Coastal Path is now in sight. Rather than requiring walkers, runners or others to tackle the old steep steps the new boardwalk will make passage a scenic stress free journey whilst the sea quietly flows beneath. Council have advised that whilst official opening is planned for Monday 30 March "a small number of associated civil engineering works to be carried out after the Easter weekend. These works will not hinder the public from using the route and are largely related to reinstatement of the surrounding grass and rock areas." Focus can now turn to seeking funding for upgrade of other sections identified in the report I requested in late 2014. With only a few sections now left requiring upgrade North Down faces prospect of having our own unique Greenway running from Belfast to Orlock near Groomsport. I am extremely grateful to all involved to helped ensure delivery of this project which helps make North Down an even better and more healthier place to live, work or visit. Whilst walking and running is permitted along the entire route of the current Coastal Path I would urge everyone to respect shared nature of the path with cyclists limiting their speed and dismounting where requested along some of the narrower sections to ensure safety of all users.